Byers' Choice wooden advent calendars add a modern twist to an age old holiday tradition. For generations, families have marked the coming of Christmas in a variety of ways. 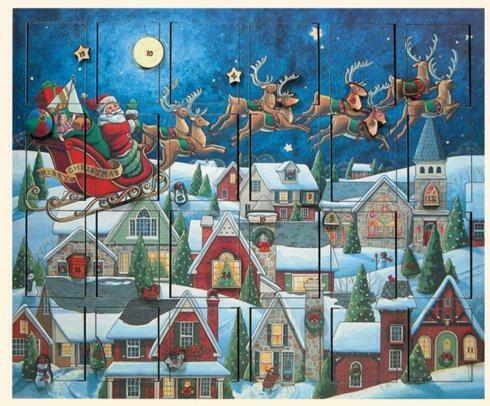 From simple chalk markings to lighting candles, families have employed unique ways to enjoy the counting of the 24 days before Christmas.Advent Calendars are thoughtfully designed with 24 numbered doors behind which small surprises can be hidden for each day. Open door number one on December 1st and the next numbered door each day leading up to December 24th. Enjoy this wooden calendar year after year and create a tradition that your family is sure to treasure. There are many different surprises that will fit behind each door depending on their relation, age and interest. Children love small toys, notes and wrapped candy. Older children at heart might like finding tickets, gift cards or even jewelry. Half of the fun is coming up with creative surprises to fill each door. What a great way to get in the holiday spirit and build up the anticipation of Christmas.